Discovering that you are being stalked, either in person, online, or via technology, can be unnerving. Learning more about stalking behaviors can help you notice them before they escalate and help you protect yourself. “Stalking is a pattern of repeated and unwanted attention, harassment, contact, or any other course of conduct directed at a specific person that would cause a reasonable person to feel fear,” according to the Department of Justice. Similar to crimes of sexual violence, stalking is about power and control. What is “the use of technology to stalk”? One of the ways perpetrators stalk victims is through the use of technology. You may have heard the term cyberstalking to refer to these types of interactions. “Use of technology to stalk” is a broad term that is used to cover all forms stalking that rely on technology. The DOJ uses “fear” to define the experience of being stalked, but there are other reactions that are just as important to consider. You might feel anxious, nervous, isolated, become stressed, or develop signs of depression. 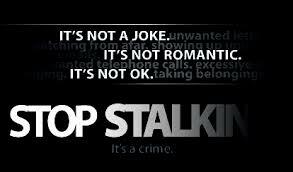 Each year in the United States approximately 3.3 million people ages 18 and older are victims of stalking1. The majority of victims are young, between 18 and 24 years old, and know their stalker. As technology and digital platforms continue to grow, so do the chances that someone could interact with you in an unwanted, sexual manner. Not all of these behaviors are considered stalking, but they can be violating and make you feel uncomfortable. Learn more about the different ways people can use technology to hurt others. If you think you are being stalked, please know you are right to be concerned. Stalking may escalate in behavior. Consider the following tips to increase your safety and effectively report the crime. Try to avoid the person stalking you. This can be difficult at times, especially if the person stalking you is close to you or your family. If you are being stalked through communication technology, like email or text messaging, make it clear that you wish to stop contact. Once you’ve made it clear, do not respond to further communication. Keep any evidence received from the stalker such as text messages, voicemails, letters, packages, emails, etc., but do not respond. You can do this by taking screenshots of conversations or even printing out email exchanges. Inform family, friends, supervisors, and co-workers of the situation. If you have children, create a code word that lets them know they need to leave the house or call the police. Consider reporting the stalking to local law enforcement. Keeping an accurate journal or log of all incidents connected to the stalking. To learn more about stalking and safety planning visit the Stalking Resource Center.